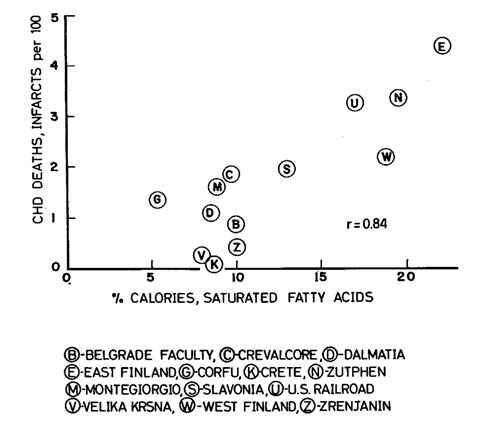 In the 1960s the SCS determined fatty acids in duplicates of the foods eaten at home among samples of the 16 cohorts. The statistical analyses of the SCS started simply with investigating the associations among average saturated fat intake, average serum cholesterol levels and coronary heart disease (CHD) incidence rates in the cohorts. 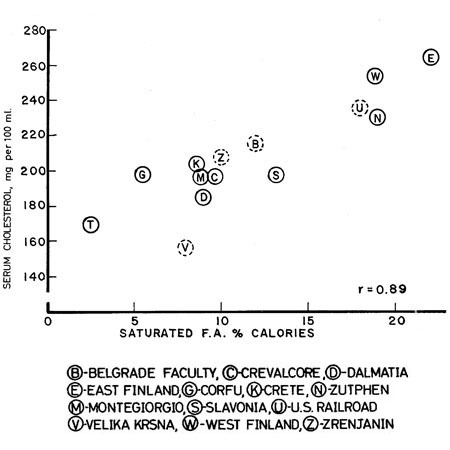 Already in 1970 at the five year follow-up the SCS showed strong associations among the average saturated fat intake, average serum cholesterol level and CHD mortality rates of the cohorts (population level, cohort level, or ‘ecological relationships’). Though causal conclusions for individuals could not be drawn from these results, these correlations are most valuable in estimating the potential of population prevention, while the totality of evidence, including results from prospective cohort studies and randomized trials, is needed to draw conclusions about causality and prevention in individuals. The cross-cultural associations were repeated using 25-year CHD mortality data for serum cholesterol and saturated fat intake and extended with associations on flavonoids and dietary patterns. Read more about these later associations. These graphs show the average saturated fat intake and serum cholesterol level values at baseline, and the 5-year CHD incidence per cohort. The cohorts of men were examined, and their average values of saturated fat intake and serum cholesterol levels were calculated. Also the number of men who died from CHD or developed a non-fatal heart attack during 5 years of follow-up per 100 men at risk was calculated for each cohort. The associations among saturated fat, serum cholesterol and CHD incidence deal with average group values and therefore the graphs say nothing about individual risk. These graphs show linear relationships between two parameters. Some are clear and steep, others are less pronounced. These graphs should not be seen as ‘X causes Y’ depictions, but rather as ‘in groups with X, also Y is observed’. The baseline Seven Countries Study data showed a strong cross-sectional correlation between average saturated fat intake and average serum cholesterol level of 14 cohorts. The average intake of saturated fat varied between 3% of energy in Japan and 22% in Eastern Finland. 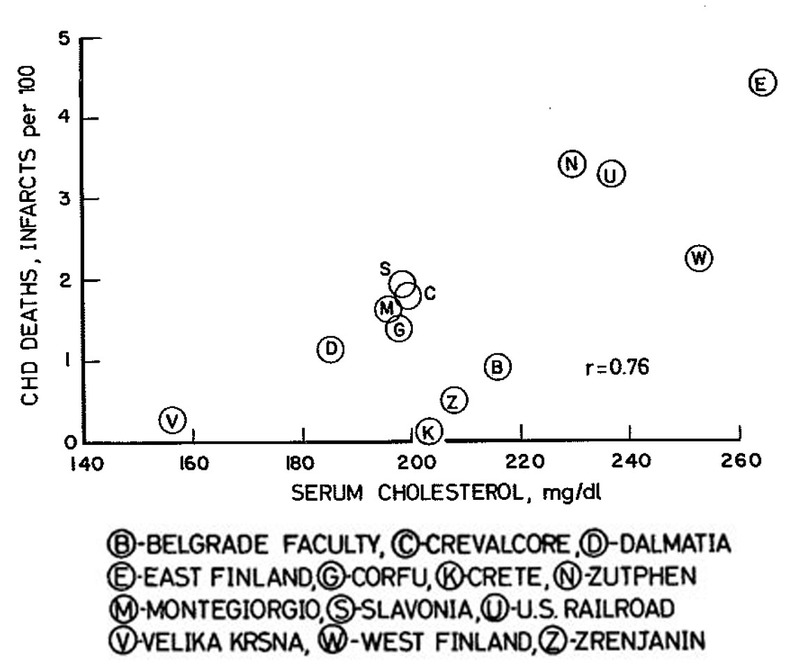 The average serum cholesterol levels varied between 160 mg/dl (4 mmol/l) in Japan and 270 mg/dl (7 mmol/l) in Eastern Finland. The following conclusion can be drawn from this graph: the cohorts with a high intake of calories from saturated fat have also a high serum cholesterol level. And cohorts with a low intake have also a low cholesterol level. This does not say that a high intake of saturated fat causes a high serum cholesterol level, but rather that there is an association at the population level which may or may not be causal. Not only the average saturated fat intake and the average serum cholesterol values differed largely among the cohorts but also the CHD incidence rates. The average intake of saturated fat at baseline was strongly correlated with the 5-year CHD incidence rates of 13 cohorts. This graph shows nicely the higher the saturated fat intake the higher the CHD incidence and the lower the saturated fat intake the lower the CHD incidence. Similar correlations were also found using 10-year CHD mortality rates. In this graph, the average cholesterol level in the blood is associated with 5-year incidence rates from CHD: the higher the cholesterol level in the group, the higher the percentage of that group that got CHD and the lower the average serum cholesterol level the lower the CHD incidence rates. This graph shows also nicely that the various cohorts were very different in average serum cholesterol profiles and in CHD incidence rates. Similar correlations were found using 10-year CHD mortality rates. These correlations support the hypothesis that serum cholesterol is related to CHD incidence at the population level. Are these cross-cultural associations causal? Ecological or cross-cultural associations are frequently viewed as the lowest level of evidence about causality. However, to demean ecological associations is to fail to recognize the powerful indication they provide about the population burden of disease – and thus the potential for prevention – when correlations among populations are congruent with sound clinical evidence, with siginificant correlations at the level of individuals within populations, and with known mechanisms. In the SCS, the average population intake of saturated fat was based on chemical analysis of duplicate portions of foods consumed as collected from sampled families, while serum cholesterol data were collected at baseline and CHD incidence verified prospectively. The differences in average serum cholesterol level among the seven countries cohorts could in large part be ascribed to differences in average saturated fat intake and were in accord with results of controlled dietary experiments. The average population serum cholesterol levels at baseline were strongly related to 5- and 10-year CHD incidence rates and were in good accord with results of randomized trials in which the effect of replacement of saturated by polyunsatured fat on CHD incidence was investigated as well as with those of trials on the serum cholesterol-lowering effect of statins. Based on the congruence and totality of evidence from prospective observational studies and cholesterol-lowering trials, we conclude that the associations found among saturated fat intake, serum cholesterol level and CHD incidence are causal.